•Simple to use - all information for use displayed on screen. •Automatic calibration takes less than two seconds to complete. •Calibration standard is mounted in a protective aluminium casing which locates on the glossmeter platform. The calibration standard assembly also prevents dust entering the instrument when not in use. •General paint and mirror finishes can be measured at 60° up to 1000 gloss units - ( Ref 157/60 and 157/SO models only ) •LCD display clearly shows readings, statistics and calibration procedure status. •Memory holds last reading and statistics after automatic power down. When instrument is switched on again the last reading is displayed. •Up to 4000 readings are stored in memory. •Instrument is powered by mains / built in rechargeable battery. •Glossmeter powers down automatically after 20 seconds to conserve battery life or recharge batteries when connected to mains power. •Lamp life is extended as it is only illuminated for a second whilst a reading is taken. •RS232 output facility is provided to download information to a printer or compurter in ASCII format. •An optional remote footswitch is available to facilitate glossmeter operation if sampling requires both hands free for test piece manouvering. Features •Simple to operate - Selection of operating parameters controlled by an in-built scroll wheel. •Easy to calibrate - At the press of a button the instrument is calibrated and ready for use. •Expanded measurement range - Now to 2000 Gloss Units allowing measurement of mirror gloss as standard •Data transfer - Direct transfer of all measurement data from the instrument to Excel spreadsheet The New Sheen Glossmaster™ range of glossmeters have been designed mainly with the user in mind. Now offering greater versatility and ease of use, these instruments have far superior data handling capabilities than ever before. With three angles in one robust, lightweight, portable package the glossmaster range will easily tackle most gloss measurement applications. The standard Microgloss 155/SO glossmeter is designed specifically for selective sampling of gloss measurement on very small areas at 60° incidence. The 2 x 2mm measurement area is of particular interest to the packaging, metal finishing, automotive and plastics industries where intricate detail or size will not allow measurement using the standard size orifice glossmeter. Microgloss 155/SO/M model allows measurements to be made to mirror finish ( 0 - 1000 Gloss units) •Fully Automatic Calibration (completed in two seconds). •Reference tile for calibration supplied as standard. •Latest reading, number of readings, maximum, minimum, average and standard deviation is displayed. 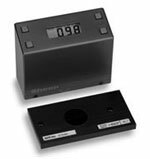 •Permanent lithium battery enables calibration data and approx 4000 readings to be stored for up to ten years. •RS232 output via a 3-pin DIN socket allows direct transfer of data to printer or computer. •Measurement time is less than one second. •Batch facility is available. •Powered by mains/inbuilt rechargeable battery. •Instrument and gloss standard is supplied in a lightweight carrying case. Features •Easy to use - one button operation. •Large backlit LCD display - visible even in low light areas. •Automatic power down - extending battery life. •Low battery warning. •Powered via mains or fitted mains rechargeable batteries. •Supplied with carry case, mains recharger and calibration standard. •Approx 900 readings per full battery charge. This pocket sized glossmeter is designed to meet all the requirements of a field and laboratory instrument but at a very cost effective price. 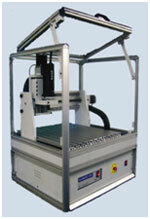 It is easy to use with a one button operation and digitally adjusted calibration. Any member of staff can take meaningful gloss measurements with little or no training. Both the optical system and the electronics are housed in a steel case giving the durability required for years of constant use either in the laboratory, on the shop floor or out in the field. Features: •Measures using 45º geometry. •Easy to use constant read feature. •Automatic calibration with tile validation. •Compatible with all important international standards. •Full Statistical Analysis. •Auto-ranging, Measures Matt to Mirror Finish. •USB Output to download analyse and Store readings in Novo-Soft. •Dry cell battery or rechargeable formats available. •Extended two year warranty. •Accurate and reliable. •Calibrate to any standard. •Lifetime lightsource guarantee. Technical specification: •Resolution: 0.1GU. •Repeatability: 0.2%. •Reproduceability: 0.5%. •Battery life: 15,000+ readings. •Measurement Area: 45º:. •Measuring Range: 45°: 0 – 1000 GU. Features •20° 60° 85° gloss – interchangeable for low to high gloss coatings. •Dual thickness measuring – Fe/non Fe - 500um. •One button calibration. •Statistics – averaging, standard deviation, auto stored. PC cable and software included. •Complete Kit includes software and cal. standards. •Simple to calibrate – simple to use. Conforms to: Gloss - ASTM D523, DIN 67530, ISO 2813 Thickness - ASTM B499, D1400, DIN EN ISO 2360, ISO 2178. Hand held instrument for simultaneous measurement of gloss and film thickness of paint, ink, plastic and other coatings on a metal substrate. 260'T' measures gloss values at 20°/ 60°/ 85° and the integral probe measures coating thickness - up to 500 microns - on ferrous/ non-ferrous substrates at the same sample point. CNC Milling Machine is a vertical 3 axis rapid prototyping machine tool that is ideal for cutting thick test samples and components. The machine is supplied as standard fully guarded with a wide up and over door which has an electrical interlock for user safety and emergency cut out switch. With USB connection the machine is connected to a personal computer or laptop, and is operated using the versatile but user friendly Windows. Flashcut CNC PC software. The 8000- 34000rpm spindle is capable of cutting materials in 3 dimensional, simultaneous motions. Pre-written CNC programs are available direct from Ray-Ran for any shape or size of test sample to any International test standard, eliminating the need for CAD trained operators. DTA - Differential Thermal Analysis - & DSC - Differential Scanning Calorimetry - measure, respectively, the temperature difference and the heat flow difference between a sample and a reference material (subjected to the same temperature variation in a controlled atmosphere). Film free shrink tester is designed and manufactured according to ASTM D 2732 and GB/T 13519, and is applicable in heat shrinkage test of all kinds of films in liquid under various temperatures. It consists of a liquid test chamber, heating elements, control elements etc. The test chamber is where the specimen is placed. The heating elements are required to get the test temperature preset, and the control system is applied to set and monitor the test parameters. Users can choose different liquid medium according to the test methods, silicon oil or glycerin.